Her mother raised a dark eyebrow. “I believe Lady Diana is something of a hoyden. And the earl of Northam is a member of the Carlton House set, an intimate of the Regent.” A mere man who kept very bad company. Mrs. Montgomery had never sought to hide her disdain for the Regent. He symbolized everything deplorable to the Camden family and their wool business. Profligate spending. Irresponsible government. Vivien jerked upright. “They were here, in Knightsbridge?” The heiress and her grandmother might as well have visited the moon. Vivien’s mother in Notorious Vow is not alone in her opinon that Lord Northam is an intimate of the Prince Regent. Prinny counts the wealthy peer as one of his friends, having great admiration for the earl’s famous racing stud Calumet. Russell does not consider himself a member of the Carlton set, steering well clear of the Regent’s foibles that marred his reputation otherwise distinguished as a patron of the arts. 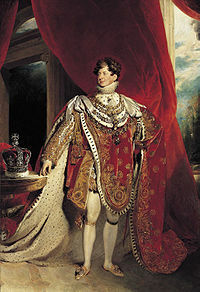 The prince might have been better remembered as an effective monarch had he availed himself of Russell’s sound advice. The Carlton Set was named for the Regent’s opulent house in Pall Mall which he eventually demolished upon moving to Buckingham Palace. When Notorious Vow opens, the Regent’s debts had reached extraordinary levels. They amounted to almost fifty million pounds sterling in today’s money. Russell is tempted to employ his vast wealth as Marquess of Wimberley to redeem a large portion of his sovereign’s debt, in desperate exchange for a favor from the Crown. A favor that will win him the woman he loves. This entry was posted in Notorious Vow, Regency and tagged Prince Regent Carlton House Set by Angelyn. Bookmark the permalink. You really know a lot about the Regency period. I had no idea Prinny was that much in debt. I remember seeing the same painting of him on GMA a number of years ago. Charlie Gibson thought Ted Koppel looked like Prinny. Now I never see the painting that I don’t think of Ted. I’m just so, so impressed with how well-researched your book is!